………it is important to me that the next report is not just an update on my situation, but to remind the public again, that marrow transplant is limited within one’s ethnic group, and I hope that people will not just read our story but support all Asian leukemia patients, now and in the future, by Taking Action and registering to be a marrow donor right away. There are a lot of unknowns right now, although my family and I are very touched by all the well wishes we have received and will continue to draw strength from the support from the community. Dim Sum (UK) – Could you save Carolyn’s life? Could you save Carolyn’s life? On a normal Monday in November 2006 Carolyn Tam went for a routine annual check-up. She had the usual blood tests and then carried on with her day-to-day life. However within three days her doctor was calling her, telling her to come back to the hospital the next morning and to go straight to the emergency room if she felt nauseous. As a healthy young woman her initial reaction was “why? !” She told friends not to worry as she could cope with anything as long as it wasn’t cancer. Carolyn went on to fight against her cancer through various treatments, including chemotherapy, leading to her leukaemia going into remission, but this April she was told the leukaemia had resurfaced and this time she need a bone marrow transplant. The terrible thing about a bone marrow transplant is that your own family members have a 70% chance of not being a suitable donor, so a sufferer’s search usually has to be broadened. Worldwide about 12 million people are registered on various databases as being possible bone marrow donors, of which approximately 1million are of Chinese ethnicity. A match in ethnicity gives the donor a better chance of being a match, especially those with the surname Tam or Lau. So of course straightaway Carolyn’s doctor went to search family records and the world database. There was no match. This spurred Carolyn’s family into action, her mother and brother immediately flew to her home in Canada from Hong Kong. Then the search began in earnest, to look for a suitable donor who could save Carolyn’s life. As we know, Patrick has a higher probability of finding a match within the Chinese community so he has concentrated his search there. Nevertheless, the poor response has surprised him, yet the case has been well publicised in Canada. Patrick even has some local celebrities backing his campaign, including Sammi Cheng and Karen Mok, but still the response has been lukewarm. The situation is similar in the UK with the Chinese registry rate being significantly lower proportionately than the amount of Chinese people in the country. According to the Anthony Nolan trust of the 395,000 people registered, only 1156 are of Oriental ethnicity. Despite this Patrick refuses to be negative: “the overseas Chinese in the UK can play a big role in raising awareness in the Chinese community. We just need one match, nothing more”. Also in the UK there is a restriction on giving blood if you are only living in the UK for a certain period, however this does not apply to potential bone marrow donors. Nevertheless Patrick remains realistic because, more increasingly, time is of the essence. According to the Hong Kong Red Cross, a patient with a common type of tissue has a 1 in 2000 chance of finding a match. Yet a patient with rare tissue has only a 1 in 100,000 chance of finding a match. Unfortunately Carolyn has a rare tissue type, therefore this means that the search for a donor takes on even greater importance. Get registered, get a friend to get registered or organise a local drive – anything will help. 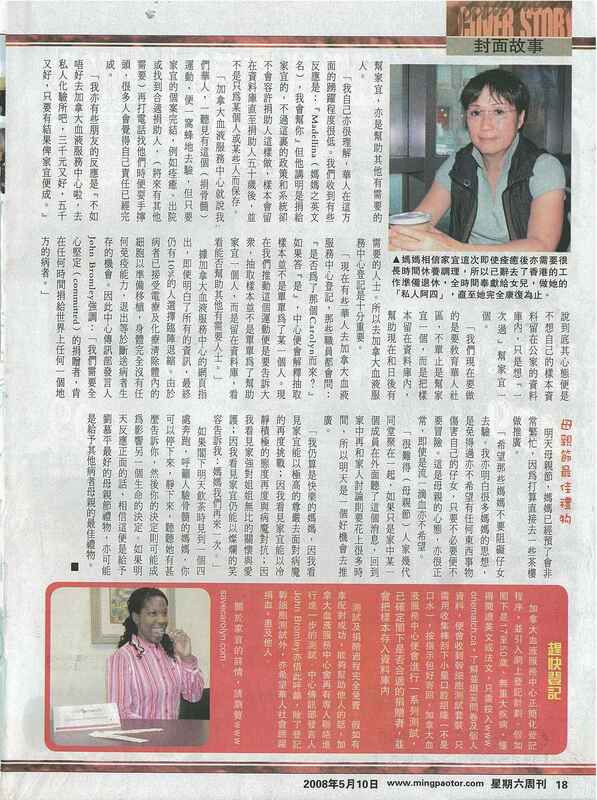 Dimsum also highlighted Kitty Cheung’s search for a donor in 2004. For further information, please visithttp://www.anthonynolan.org.uk/ or http://www.savecarolyn.com/ , as you could save a life today.